The new Trade Union Bill 2015-16 is a piece of blatant class war by the ruling class and their Tory representatives in Parliament. Not content with making the lives of millions more miserable by tax credit cuts, the Tory Government is now preparing further cuts and wage freezes in the public sector, and as part of this plan, it’s launching a new anti-strike law. Last July, thousands of workers in transport, education, the civil service and the health service went on strike on the same day against the erosion of their living and working conditions. The Institute of Directors immediately called for new laws to increase the threshold in strike ballots from a simple majority of those voting to an absolute majority of everyone eligible to vote and the turnout has to be at least 50%. It’s a nice trick since it turns every abstention into a no vote and that’s the aim of the game. Using the same calculation not a single British Government since the Second World War would ever have got a majority. The current Tory government got the vote of less than 25% of the electorate in the last election but got over 50% of the seats in Parliament. Even with all the constant pressure on people to vote, there are still between 30% and 35% of people who do not vote in General Elections. It will be very difficult to get a sufficient turnout for a majority yes vote for a strike using only postal voting. This is exactly what the Bill’s drafters intend. And just to make it totally clear who the real target is, in the “important public services” a 40% threshold for a yes vote of those who vote (i.e. 80% of voters if the threshold is only just met) is needed. In fact most strikes are in the private sector, but due to the larger workforce in services like health and education 95% of all strike days lost are in the public sector. With public sector workers set to face more wage freezes and worsening working conditions the purpose of the bill is obvious – to stop any widespread class response. On top of all this, any planned strike would have to give 14 days notice to employers (it’s currently 7 days) and employers would be allowed to bring in scab labour (from agencies) as cover. They’ll also be able to seek an injunction against any proposed strike action and even sue for damages. Solidarity action is already banned, but this law will reduce legal pickets to 6 with the union having to nominate a picket organiser who will have to wear an armband to indicate who s/he is, give her or his name to the police or “anyone who asks for it”(!) and carry a letter from the union to say that they are the accredited representative of the union. Police will also have to be informed of any loudspeakers or banners the strikers intend to use. Unions will even be obliged to reveal what they intend to say on social media. Failure to comply with any of these can result in massive fines. And it should not be forgotten that, unlike in many European countries, there is no real right to strike since strikers in the UK are not protected from the sack. Some of this is already facing opposition – from worried bosses. David Davies, the right wing Tory MP, has compared the picketing clauses to the conditions of Franco’s Spain whilst a Financial Times editorial asked why the Tories have “crossed the road to pick a fight”. As they point out, there were only 12 strikes in manufacturing last year and only 788,000 working days were lost to strikes throughout 2014 (compared to the 13 million a year during the 1970s). The FT argues that the bill “could end up producing greater levels of disruption”. Let’s hope they’re right. These enemies of our class are obvious, but we have plenty of false friends who claim to fight on our behalf. Workers can only defend themselves when they act and fight on their own account. This is disputed by many on the left who believe simple membership of a trades union is the key to winning any struggle. The truth is that unions today exist only to negotiate the terms of the sale of wage labour with the capitalists. They succeed at best only when the labour market is tight. 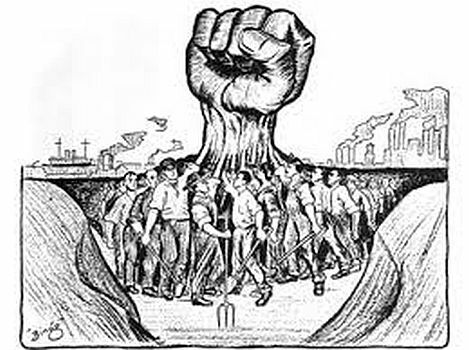 In periods like now where de-industrialisation and casualisation of the workforce has weakened the social cohesion of the working class they are largely impotent. The Tories are confident in pushing through this anti-strike legislation partly because only a quarter of the workforce today is in unions but also because the class appetite for struggle is so low. But once the working class does revive and start to fight back it will find, as workers did in the past, that the unions are there to put a brake on the struggle – to stop it from taking on a wider political aim and confine it to a mere dispute over wages and conditions. “Trade Union organisation was the only thing between us and anarchy, and if the trade union organisation was against us the position would be hopeless”. A repeat performance in the 1926 General Strike made it clear that the unions were integrated into the capitalist state apparatus. “Industrial (good) relations” now replaced the struggle for a decent living as far as the unions were concerned. The unions have acted ever since like an extra layer of management, creating massive bureaucracies and protecting the hefty salaries of their officials. Even under the law as it stands now, when workers do vote for a strike only 1 in 5 actually take place. The unions generally prefer to compromise rather than risk their funds and investments in fighting. The Trade Union Bill is also about a fight between two sections of the British ruling class. The extra clauses the Tories have added to make it harder for unions to support an already cash-strapped Labour Party might make it seem as though Labour somehow represents the working class. But Labour Governments have also tried to use the law to curb strikes (way back in ’74 Barbara Castle did just that and in 1911 Arthur Henderson and 4 other Labour MPs tried to get a law passed where strikes would have to give a month’s notice before they could go ahead). The ‘Labour movement’ has a long history of trying to control the class struggle. Labour has used troops against strikers many more times than the Tories. Even the argument that being in a union can give workers confidence to fight back without fear of individual victimisation is nonsense since this is at the expense of union members hardly knowing what the union is doing in their name. What’s more, unions don’t unite the working class – they divide it section by section. The unions don’t need government legislation before they oppose solidarity action. They have been doing this for years. Even last July’s strike day was turned into a protest ritual rather than evidence of a real fightback. And the working class divided is exactly how capitalism wants us. The TUC’s only response to the latest anti-strike bill is to call for a lobby on the day before it is due to go to Parliament (November 2). They have issued special instructions on how to lobby. At most this will get some minor concessions which the TUC will parade as a kind of success but it does not change much for the unions themselves. What the law doesn’t cover is action outside of and against the union. Workers taking wildcat action (as the Financial Times fears) and going beyond union boundaries, giving solidarity on picket lines, organising mass assemblies of workers to elect recallable delegates to strike committees in order to organise real resistance have a lot better chance of fighting austerity than the current charade. At present there is not much confidence amongst workers to take these steps and many will point to the divisions in our ranks (like those between precarious, temporary and full time for starters) but austerity is not going to go away. At some point a new “poll tax” moment which hits at enough of us at the same time will arrive (the arrogance of the ruling class knows no bounds) and then we will be able to take on board the lessons of past struggles as the telecom workers in Spain did earlier this year (see our website). We have nothing to lose but the debts which chain us to capitalism. Another world is possible.